I’ve always been fascinated with popovers and the incredible heights they can achieve. 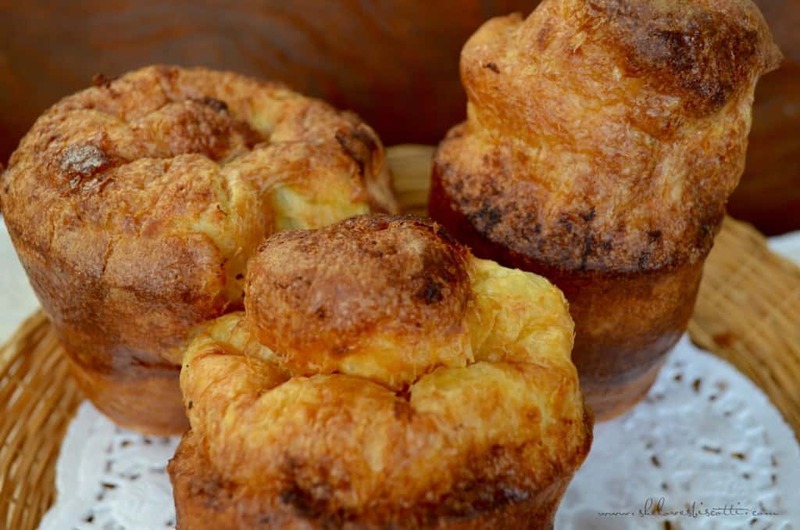 Have you ever wondered why popovers pop over? Read on to find out. Milk and eggs must be at room temperature. Popovers depend on the water vapour or steam which is formed by these liquids evaporating very quickly in a very hot oven. Yup, you guessed it. The oven must be hot, hot, hot. Position the rack in the lower third of the oven. The combination of milk, eggs, and all-purpose flour will create a chemical structure that will trap the steam. So, in other words, when the crepe-like batter is placed in a hot oven, this gluten matrix entraps the steam, allowing it to expand up to three times its volume. The batter essentially “pops over”! Do NOT overmix the batter! Whisk the batter until it comes together. It’s okay to have lumps in this very thin batter. Place the batter in a pitcher with a lip and let the batter rest for at least one hour at room temperature. When the pans are ready, you need to act fast…the batter can quickly and easily be poured from a pitcher which has a spout. 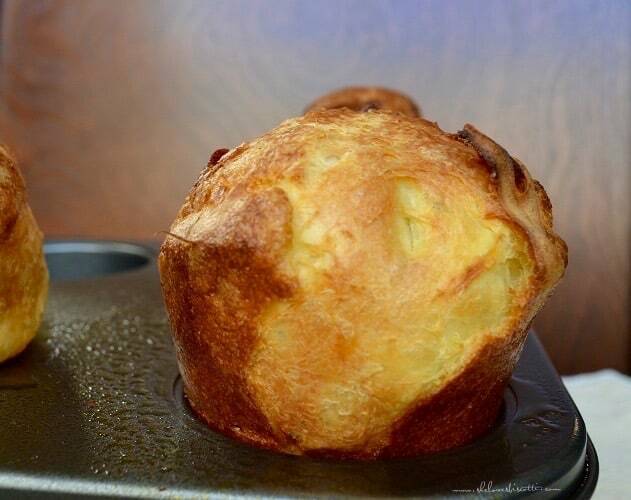 Popover pans have high and narrow cavities which contribute to the steam formation. The pans must be very hot. Once your oven has been preheated to 425° F, place a dab of butter (1/2 teaspoon) at the bottom of each cavity of your pan and place in the oven for about 2 minutes. Then place the popover pan on top of a baking sheet. The baking sheet contributes to heating the bottom part of the popover pan which contributes to a greater pop. The butter will ensure a crisp crust. When you remove the hot pans from the oven, the butter should be sizzling. Get ready to spray the sides with a non-stick spray and quickly pour the batter to 3/4 full. Quickly place them back into the oven for the specified amount of time. Whatever you do, do not open the oven door. 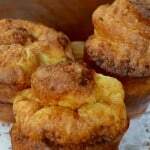 I adapted a basic recipe for popovers from Ina Garten (Food Network). There are so many add-ins that work wonderfully with this recipe. Cheese, herbs, chocolate and cinnamon-sugar are some possibilities. Now you know why popovers pop over. Have fun making them! I've always been fascinated with popovers and the incredible heights they can achieve. 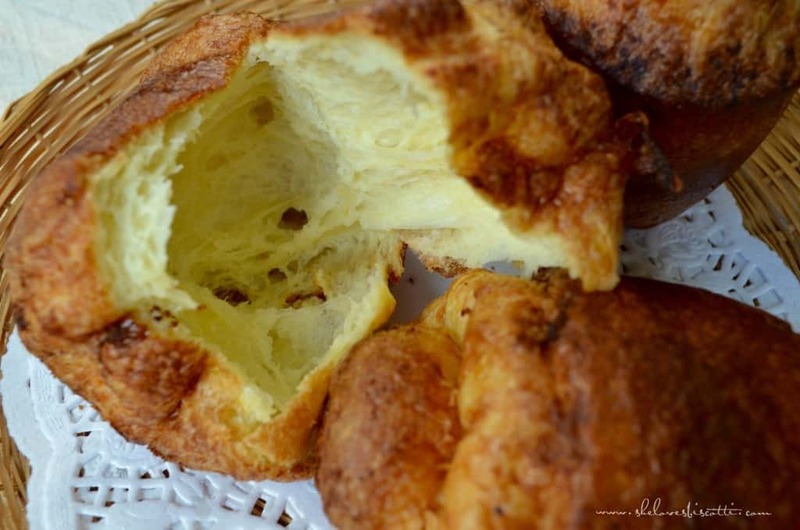 Have you ever wondered why popovers pop over? Read on to find out. In a medium bowl, sift flour. Set aside. In a large bowl, whisk the eggs until frothy. Continue to whisk while adding the milk, vanilla and salt. Add the flour and whisk until the batter comes together. Batter should be thin and lumpy. Place the batter in a pitcher with a lip and let the batter rest for at least one hour at room temperature. Position rack in the lower third of the oven. Place a dab of butter (1/2 teaspoon) at the bottom of each cavity of your pan and preheat pans in the oven for about 2 minutes. (Place the popover pan on top of a baking sheet). Remove pan from the oven and immediately spray the sides with a non-stick spray and quickly pour the batter to 3/4 full. Bake at 425° F for 15 minutes. Lower heat to 350° F and continue to bake for at least another 15 minutes until golden brown and dry to the touch. Once out of the oven, remove popovers from the pan immediately and poke a small hole in order for the steam to escape. Made popovers yesterday for the first time and they were great. I was a bit worried because I used a regular muffin pan, but they popped over just fine. As always, thanks for another delightful recipe, Maria. How wonderful! I haven’t made this recipe in a while… I might have to do something about that 😉 Thanks for your kind words Louise, appreciate it ♥ Have a wonderful week-end!